A body book with a difference! Boris and his little sister Clara are having a busy day. But what needs to go on inside their bodies to help them run, play and eat? This is a unique book with a narrative and basic information side-by-side. It is specially aimed at toddlers and preschoolers who are not quite old enough for fact-packed non-fiction body books, but still curious about why their hearts beat and what happens to the food in their tummies. 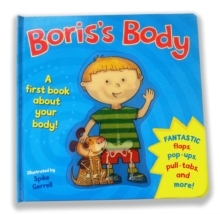 They can watch the amazing cover lenticular change to reveal the bones inside Boris's body, make a heart beat with the innovative magic-motion mechanism, and even pull a tab to make a poo disappear down the toilet! With a giant pull-down skeleton to finish, it is the perfect interactive and informative experience.